Data: Zipped ea.ml1 shapefile can be found here, and the country outline can be downloaded here at the GADM site. 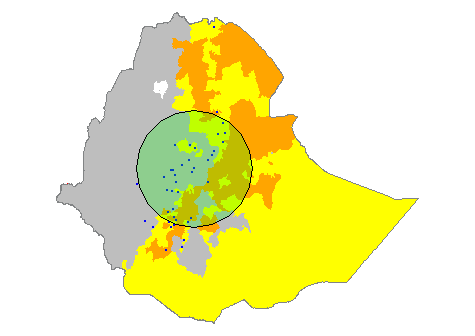 I've been using the Ethiopia ESRI shapefile. Branch locations are here. For now we can ignore the buffer. What I'm interested in is counting which points (branch.clip.prj) exist within each ML1 level of eth.clip.prj. To achieve this in QGIS, I use the "join attributes by location" tool, which outputs a new shapefile + attribute table that neatly lists all of the objects and features of the branches AND the ML1 values that were pulled from the eth.clip.prj. From what I've gathered, to count the points within each polygon, I use sp::over, listing first my points, then the shapefile. #add for all needed attributes, etc. Sorry this got a bit wordy. So, my ultimate question is: how can I efficiently keep all of the data from my point objects when I aggregate them by polygons with the sp::over function? As pointed out by JeffreyEvans, the use of sp::over was the problem. By using raster::intersect instead, the output included attributes of both point and polygon data. Not the answer you're looking for? Browse other questions tagged r fields-attributes aggregation sp or ask your own question. How do I retain all attribute data when clipping two polygons in R?